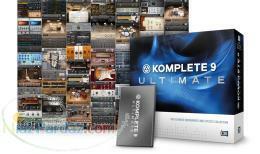 KOMPLETE 9 delivers 33 full-fledged instruments and effects, 12,000 inspiring sounds and over 260 GB of premium samples. KOMPLETE 9 comes with inspiring new instruments and effects set to change the way you create – supercharged drum sampling, rich, organic synthesis, unbeatable studio effects, a piano with an enormous sound, and an ultra-intuitive, playable string ensemble. Two products make their worldwide debut in KOMPLETE 9 and a set of powerful sonic sculpting tools return with a slick new update.MONARK – Captures every nuance of the king of monosynths in spectacular detail. This is the holy grail of analog modeling. BATTERY 4 – New look, major workflow enhancements, and a supercharged new library. The legacy begins again. SOLID MIX SERIES – A supercharged studio effects suite with a precise, transparent sound, sleek and clean new interface, and stunning additions such as side-chaining and parallel compression.